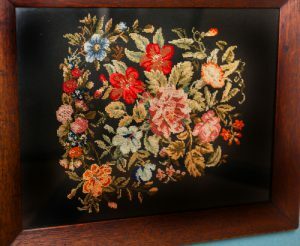 Framed needlework stitched 1847 by Elizabeth Field . Who was Nellie Payne? Framed needlework by Elizabeth Payne. This piece of framed needlework was stitched by one of Nellie’s older sisters, Elizabeth (known as Lizzie) who was born in 1853 and died in 1920. She married Charles Easton and they had no children. It was worked by Lizzie in 1847 when she was just 16 years of age, and shows what a talent these Field sisters possessed. Lizzie and Nellie’s younger sister Ethel, went to England to live with Nellie for a few years. There Lizzie took care of the home and Ethel joined Nellie studying arts and craft at college. This piece is petit point stitched on velvet.